New updated TV carts are loaded with more practical and functional features for portable AV solutions. This new selection is developed from professional feedback to create a simple-to-use system, offering an all new experience in the areas of mobility, flexibility and installation. Ideal for situations like public places or businesses where many people share limited equipment. 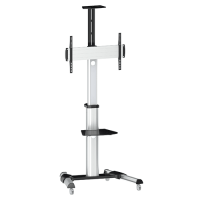 Q-Tee's new aluminium QTV04-46TW mobile TV cart features a stylish, technical and functional design to provide elegant presentation solutions for 40-70'' LED, LCD and OLED flat panel TVs up to 50kg. It also does a 90° rotation allowing for landscape / portrait orientation viewing. An innovative spring lock mechanism makes it easier and effortless to adjust height to a desired position. Featuring 4" shock-absorbing wheels, this supports the equipment weight while allowing for swift manoeuvrability and smooth, quiet positioning. Integrated cable clips keep cables organized. This product is Ideal for video conferencing (supplied with top camera shelf), public displays or other professional presentation.